Chunky Monkey Popsicles | FoodGaZm.. 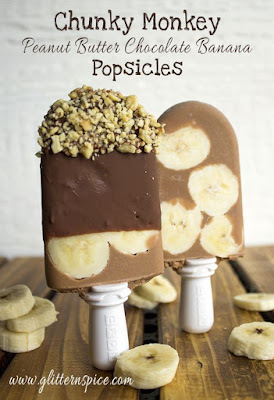 If you are a fan of bananas, chocolate and peanut butter, you are gonna love these Chunky Monkey Popsicles! One of my kids favorite snacks is a banana smothered in peanut butter with chocolate chips and chopped peanuts sprinkled on top, which was the inspiration for these tasty popsicles. Even the name of these ice pops holds a special place in my heart because I used to call my daughter a little chunky monkey when she was a baby!